MAnE-EP™, the Mission Analysis Environment for Electric Propulsion, is the low-thrust counterpart of MAnE™. 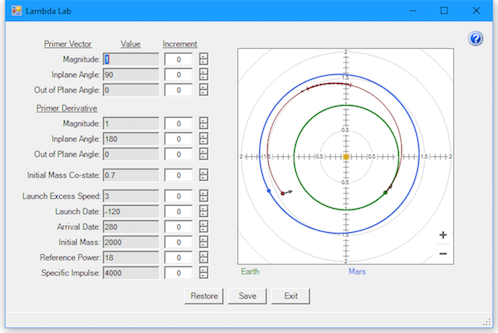 It is a system of software tools, seamlessly integrated within a graphical user interface, to support the analysis and optimization of multiple leg, heliocentric missions which employ electric propulsion as the principal mode of thrusting. Full optimization of missions with up to 14 distinct legs is supported. The calculus of variations is the optimization method employed. The trajectory optimization component of MAnE-EP is HILTOP™, whose heritage spans over four decades. HILTOP was employed in numerous NASA and industry studies of missions to all the planets and to many comets and asteroids in different mission opportunities. HILTOP has been validated by direct comparison of results with other industry software and has been employed by the developer in various New Frontiers and Discovery class mission proposal developments. Experiences gained with these exercises were used to refine the product to perform more effectively and efficiently in typical situations encountered by a mission analyst. MAnE-EP began in 2004 as an effort to re-develop and update HILTOP using modern development tools and to add the graphical user interface. The first fully operational system that includes all components, documentation and example cases was released in September 2017, following extensive testing over a wide variety of missions. SpaceFlightSolutions™ places high priority on the integrity and usability of its software products. Numerous data dependent internal tests are performed during operation to monitor validity of results being calculated and messages are logged of all significant events encountered as a record for subsequent evaluation. Additionally, program options are provided that allow the user to test the optimality of the converged results. A variety of documentation features at the field, form and concept levels are provided to support the learning process for becoming productive in the use of MAnE-EP. Licensing of MAnE-EP is required for each individual workstation on which the application is to be executed. Licenses are perpetual and include one year of support and version upgrades that are released during that time. Continuation of support is available via annual subscriptions. Contact SpaceFlightSolutions for current licensing and support fees for MAnE-EP. 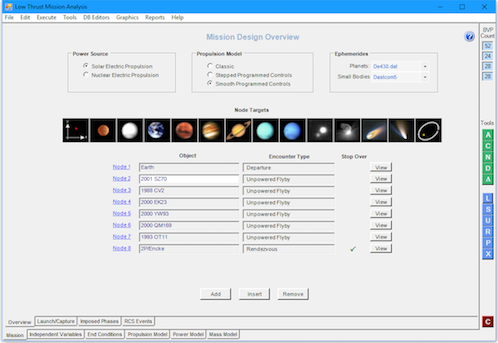 Creates 20+ output files designed for presentation and analysis of mission data. The MAnE-EP GUI provides a common framework within which the many components of the environment are integrated. The framework provides an organized presentation of the input required for a given environment component and a convenient method to execute the component and retrieve the relevant results. This visual approach enhances understanding of the component and of the problem being addressed and significantly reduces instances of missing or erroneous inputs. When MAnE-EP is started, mission input data from the most recently executed case populates the input forms of the GUI. The initial form displayed is known as the Mission Overview form, an example of which is shown below. This form displays the itinerary of the mission as presently defined. Targets in the itinerary may be added, removed or changed. The icons in the target ribbon are active and are used to specify the target of interest at a given node. The option buttons at the top permit the selection of models to be used for evaluating trajectories; the choices made here affect the content and display of data of subsequent forms; that is, data items that become inapplicable for certain models are either hidden or deactivated to aid the analyst in the efficient use of MAnE-EP. To assist new users, the purpose of each active control on all forms are described in a tooltip that is displayed when the mouse hovers over the control. Several artifacts of the above form are common to all of the data entry forms. These include the bar menu at the top, the icon in the upper right corner, the boundary value problem counts for the problem as currently defined, the toolbox of green, blue and red buttons on the right, and the tabs along the lower border. The bar menu and sub-menu items provide access to all supporting applications, database editors, graphics features, data reports, documentation and help files. With few exceptions, accessing any of these features results in the display of an additional form with its own set of controls and data. The toolbox provides quick access to the most frequently used applications and functions, which are also accessible from the bar menu. The tabs provide a mechanism for categorizing input parameters into meaningful sub-groups. By processing the tabs from left to right, one is assured that the adaptive forms properly reflect the effects of choices and decisions made on prior forms. The group of green icons in the toolbox are used to quickly access support applications frequently used while performing mission studies. From the top, the first three applications evaluate Alignments, Closest approaches, and Nodal crossings of any two bodies that occur within a specified time interval. Next is an application that converts between calendar and Julian Dates, and the final icon in the group is the Lambda Lab, an application that allows one to vary the values of the independent variables and immediately observe the effects on the trajectory profile. It is a powerful tool for improving initial estimates of independent variables to initiate the solution to the boundary value problem. The blue icons in the toolbox deal with the mission definition currently loaded in the user interface. 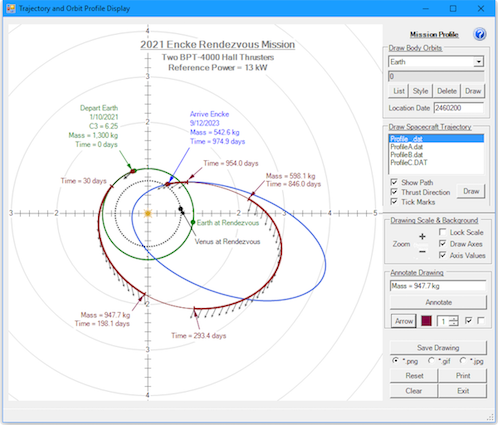 From the top, their purposes are to Load a mission from the mission database into the user interface, Save the currently defined mission to the missions database, Update the independent variables to the values at the end of the most recent execution, open Reports of results from the most recent execution, display the orbit and trajectory Profiles of the current mission, and eXecute the mission currently defined in the user interface. The red button is used to close MAnE-EP. Additional features are available from the menus. These include transferring and receiving mission solutions developed on other computers that host MAnE-EP, interrogating ephemerides and displaying tabular and graphical results, searching for near encounters of small bodies along a trajectory, appending trajectory segments to extend a mission, documentation at the form and application levels, output report descriptions, analysis guidance and troubleshooting tips, and example cases. 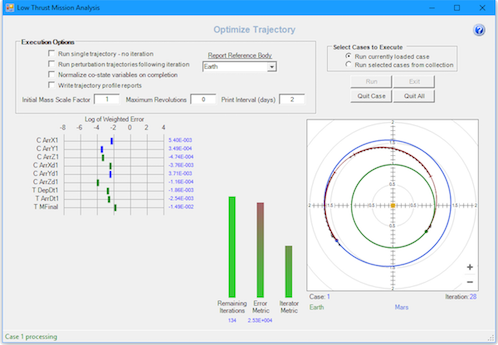 The trajectory optimization program HILTOP is based upon the zero sphere of influence patched conic model of the solar system; that is, heliocentric trajectories are computed under the assumption that the sun is the only attracting body. Once the terminal heliocentric velocities are known, the velocities relative to the terminal body are evaluated and equated to planetocentric conditions at infinity. This method is alternatively referred to as “matched asymptotes”. It is generally regarded as sufficiently accurate for purposes of preliminary mission analysis and for propulsion system sizing and selection. This model is virtually identical to that employed in MAnE. Trajectory optimization is achieved with the indirect techniques of the Calculus of Variations. While the solution to the boundary value problem that results with this approach is considered by many to be overly difficult, the robust iterator that is used in the program, combined with the innovative tools incorporated in MAnE-EP substantially reduces the severity of the problem. Advantages of indirect techniques are that convergence tends to be quadratic in the neighborhood of the solution and that convergence assures that the solution is locally stationary. Additionally, indirect methods permit identifying far more detailed optimal thruster operational conditions than direct methods that are currently available. The ultimate boundary value problem to be solved is comprised of an equal number of independent variables and end conditions. The end conditions are, in turn, comprised of the constraints that are specified for the problem and the applicable natural boundary, or optimality, conditions for the problem posed. The natural boundary conditions are automatically formulated within HILTOP so that the user need not be concerned with specifying those that apply. This is but one of the many user-friendly features encoded in HILTOP to significantly reduce the learning curve for productive use. Automatically display output reports in Notepad, Excel or Wordpad, as appropriate. – Display/print ecliptic plane projections of solar system body orbits and spacecraft trajectory. 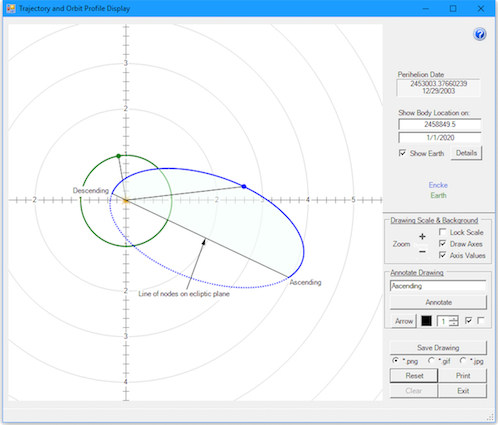 – Display while optimizing a trajectory. – Orbit of ephemeris body. – Within MAnE-EP, many of the standard reports are automatically opened in MS Office Excel. This makes available all the graphics features of the spreadsheet program for use with the data in the report. 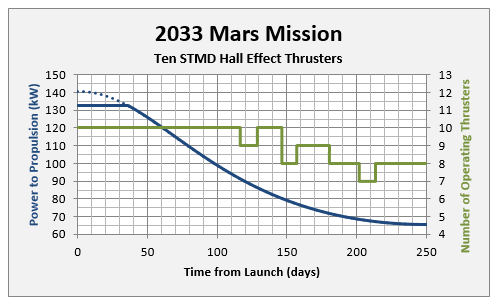 Following is an example of a graph of propulsions system parameters as a function of time for a mission to Mars. Documentation of MAnE-EP is provided electronically in a variety of formats and is installed on your hard disk along with the software. A stand-alone installation guide is provided that explains the process for new and subsequent installations. MAnE-EP is developed and tested for operation under Windows 7 and Windows 10. A minimum of 2 GB of free disk space is recommended. Memory requirements are principally those needed to adequately run the operating system. Computer processor speed of 2 Ghz or higher is recommended. SpaceFlightSolutions provides aerospace trajectory optimization software, as well as software training, aerospace mission consultation, mission analysis and support, and more to clients across the world. We appreciate your visit to SpaceFlightSolutions and we invite you to contact us if you have any questions or if you’re ready to get started.